Winter Storm To Impact The Region Tuesday And Tuesday Night - Remember Your Pets In Your Preparation. Nassau County, NY - January 21st, 2014 - In anticipation of the approaching winter storm the Nassau County SPCA again urges pet owners to make preparations ahead of the storm to keep their families and pets safe. The most important thing pet owners should do is to bring their pets indoors, if conditions are unsafe for humans, they are also unsafe for pets. Always bring pets, indoors, including outdoor cats, at the first sign or warning of a storm. 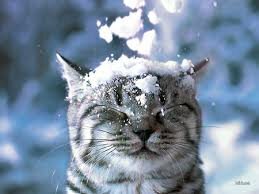 A snow storm is no place a pet. Don't let your dog off the leash after heavy snowfall. Dogs can lose their scent during winter storms and easily become lost. Make sure all pets wear collars and tags with up-to-date identification. Deep snow cover can confuse a pet and cover their familiar scent landmarks. It is easier, and more dangerous, for your pet to be lost in snowy weather so keep an eye on them at all times when outdoors. Stock up ahead of time on all pet food and medicine your animals may need-travel may be much more difficult or impossible. Prepare for a power outage, especially if your family includes fish, reptiles or pocket pets. Clean off your dog's paws with a moist washcloth after going outside. Snow-melting salt can be very painful to dogs' feet and can make them ill when ingested. Have a coat and booties ready for any dog that needs them. Be ready to protect your pets from very strong wind and cold. The Nassau County SPCA urges pet owners to develop an emergency plan that accounts for the safety of their animals and to stay up to date on storm warnings in their area. Arrange a safe haven for your pets in the event of evacuation. Do not leave your pets behind. Subject: LongIsland.com - Your Name sent you Article details of "Nassau County SPCA Offers Winter Storm Pet Tips in Anticipation of Tuesday's Snowstorm"